In the early 1860s, Carl Wendt buys a forest and farming property in Perstorp, in the heart of Skåne, Sweden’s southernmost province. His ambitious plans include breeding carp and launching a beechwood lumber business. Wilhelm Wendt, his eldest son, takes a degree in engineering at the Institute of Technology in Stockholm, then heads for Germany and France to learn more – like how beechwood can be used to produce a variety of chemical products. In 1881, Wilhelm Wendt founds a company called “Stensmölla Kemiska Tekniska Industri” and starts building a charcoal-burning plant to produce acetic acid/vinegar, tar, charcoal and wood alcohol (methanol). Perstorp’s vinegar is an immediate success. 1886 the company name is changes to “Skånska Ättikfabriken” (acetic acid plant). There are 16 employees. Production is growing constantly. A plant for carbon black is built in 1894, and later a distillery for methanol, denatured alcohol and acetone. Wilhelm Wendt has obviously inherited his father’s entrepreneurial spirit and drive, and on the death of his father in 1895, also inherits the property. The foundation is laid for many of the products that will become The Perstorp trademark: formaldehyde, binding agents, thermosets, molded products and laminate. In 1918, the experiments of Innanendra Das Gupta, a young Indian chemist, result in Scandinavia’s first plastic material – a shellac substitute called Indolack. A few years later, a thermosetting plastic (Isolit) is developed, and Perstorp’s first plastic product is born - an electrical switch handle. Word War I means big business in Perstorp. A glassworks is built, initially for vinegar bottles, later for other products. In 1917 the sawmill adds a furniture factory and the company begins turning out elegant furniture, radio casings and beechwood parquet. By 1923, Perstorp has developed phenolic resins that are used in new products. First in industrial laminates for the electrical and radio industries, then in decorative laminates for tough tabletops and other demanding surfaces. But they can only be made in dark colors, since the phenolic resin used to impregnate the paper is black. Working conditions are miserable, and Wilhelm Wendt runs his plants with an iron hand. 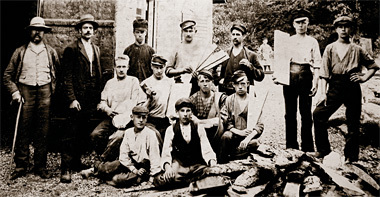 A union is organized in 1918, numerous conflicts ensue, including a nine-month strike in 1924. The company’s economy is precarious. Everything has been invested in plants, experiments and marketing. Perstorp’s vinegar is an immediate success..
An order of 100 liters of vinegar from a customer in Östersund in 1892. From a catalogue of isolit products.